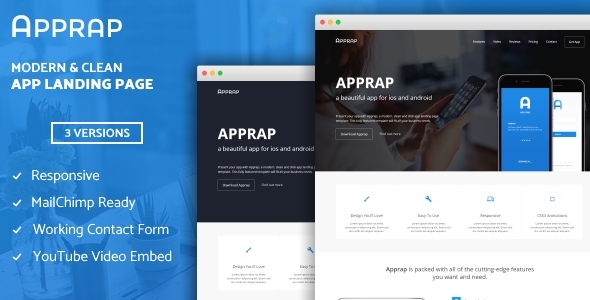 Apprap is a modern, neat and engaging app landing page template; providing your users a clear insight into what your app offers. Apprap is perfect for those who want to show off their app in a striking, trendy and creative way. Apprap comes with a working PHP contact form and working PHP MailChimp subscribe form to help you engage with your users. A complete step-by-step guide has been included to help you set up a Mailing List with MailChimp. Apprap uses modern HTML5 and CSS3 technologies to create an engaging and up-to-date website. Apprap uses minimal and elegant CSS3 and jQuery animations to provide a smooth and crisp experience. The fully responsive template adapts to computers, laptops, netbooks, tablets and modern smartphones. 3 Versions: 3 versions included for the price of 1. Typewriter Text Effect: display a slogan / text in a stylish typewriter effect. Logo: add your business logo. Smooth Scroll Navbar: jQuery smooth scroll buttons. Working MailChimp Subscribe Form: working subscribe form. Step-by-step MailChimp Integration Guide: step-by-step guide on how to create a MailChimp account, create a mailing list and connect it to Twist. Modern Features Layout: display your apps features in a dynamic and stylish manner. YouTube Video Embed: easily embed a YouTube video of demonstrating your app or services. Working PHP Contact Form: easily set up a contact form to direct to your email address. Pricing Plan Tables: easily display your app’s pricing plans. Retina Ready Icons: Google’s Material Icons font set for smaller devices. Cross-Browser Support: template supports most modern browsers including: Google Chrome, Firefox, Opera, Safari, Edge and Internet Explorer. CSS3 and jQuery Animations: minimal and elegant CSS3 and jQuery animations. Responsive Layout: the template adapts to computers, laptops, netbooks, tablets and modern smartphones. Background images displayed in the demo versions are provided by Pixabay under the Creative Commons license. They are not included within the purchase files. Mockup images displayed in the demo versions are provided by MockUPhone under the Creative Commons license. They are not included within the purchase files. Google’s Material Icons font is provided free under the Apache License Version 2.0, more info: here.